Le Big Blues Bender 2019, du 5 au 8 septembre. THE BENDER HAS A NEW HOME!! 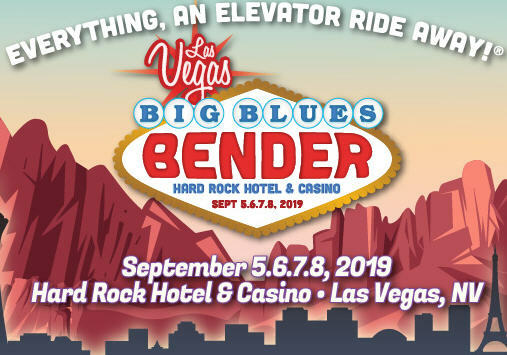 We are excited to announce the Big Blues Bender 2019 will take place September 5, 6, 7, & 8, 2019 at the world famous Hard Rock Hotel and Casino Las Vegas! There is no better fit for the Bender than the Hard Rock. The venues are outstanding, the amenities are world class, and the spectacular resort environment will make this Bender a luxurious and outstanding experience you’ll never want to leave! As you may imagine, the decision to move the Bender is a complicated one, and as a result, we do not currently have room inventory, pricing, or sales dates to offer at this time. We intend to announce this information VERY SOON! Please bear with us as we put the finishing touches on our offerings and prepare yourself for the Bender of a lifetime! Check out our spectacular 2019 lineup, with more to be announced!